Yesterday brought the first real snow this winter. Temperatures adjusted for wind chill dropped into the single digits and snow covered the ground throughout the city. We still wanted to take Arya for our normal walk so we were left with pushing our baby stroller through snow for three miles. An overnight storm had dumped as much as a foot of snow in parts of the city. With little time to dig out in the morning, many sidewalks in front of residences and small businesses were iced over with several inches of snow. Boston has an unusual sidewalk snow removal law forcing private property owners to be responsible for removing snow from sidewalks and curbs. Large businesses and professionally-managed residences generally follow the law and remove snow in three hours. But smaller entities take far longer to get rid of the snow piling up in front of their buildings. Excess snow left icy sidewalks throughout our path through the city. The bicycle tires of our baby stroller had sufficient grip even in the iciest condition. However, pushing a stroller filled with baby and her belongings leaves us slightly off balance so walking through the snow-covered city was a slow process. Ironically, the heft of the stroller keeps it from slipping in even the worst ice, but makes the adult pushing it lean forward and become subject to slippery ice. The alternative to pushing our baby stroller through the snow would be not going out at all. Arya looks forward to going outside and we like the exercise. It also help baby fall asleep in the stroller if we go for a walk at a consistent time each day. 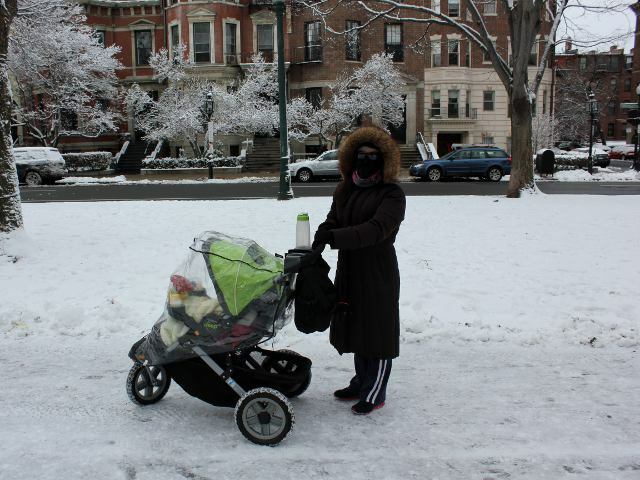 So having a larger stroller is well worth it since it enables us to walk through even heavy snow.